Gareth Edwards takes time to update us on Godzilla and the monster's history in this 60th anniversary year of the famed Japanese creation. Mr. Edwards' film is the kind of old-fashioned matinee throwback that entertains, excels and endures. "Godzilla" is a terrific blend of character drama, 1950's sci-fi suspense spectacle and breathtaking special effects extravaganza. A team of scientists note seismic activity in Japan and investigates. The drama shifts through several Far East cities and to Washington D.C. and San Francisco, where service man Ford Brody (Aaron Taylor-Johnson), who has experienced tragedy, is called to be part of a mission to essentially safeguard mankind from giant marauding cockroaches. Ford's dad Joe (Bryan Cranston) has been avidly following, questioning and trying to counteract scientists' infiltrations and environmental manipulations for years, and attempts to shut down and investigate whatever malevolence is swirling. Godzilla himself does the rest. His presence is loud and unmistakable, yet Godzilla is a calm figure. He's a stabilizer, heroic and silent in his manner as he balances out the chaotic spectacle of two humongous (mating?) mantises as the world threatens to wilt at the sight of all of this gargantuan body heat. Mr. Edwards shows Godzilla as a majestic not malevolent figure. The director uses Godzilla sparingly as a character, enhancing his presence in his few appearances, giving "Godzilla" a more treasured and hallowed quality than it might otherwise have. The ensemble acting from the impressive cast in "Godzilla" is natural and unforced, as are the arresting special effects. Also outstanding are Owen Paterson's excellent production design and Alexandre Desplat's score, the tone of which perfectly outlines the film, particularly in its cleverly designed opening credits. Most terrific though, is the direction by Mr. Edwards. He directs "Godzilla" so very well, building suspense, tension through good, measured pacing and above all masterful shot-making that resonates. His picturesque shots (Seamus McGarvey's cinematography) of disaster, of San Francisco's Golden Gate Bridge (including a scene with a Hitchcock "Birds" San Francisco flourish over part of the Bridge) are beautiful. It's all wise, intelligent and deft filmmaking, without a hint of bombast despite the sheer magnitude and scale of the film's frenetic, pulsating atmosphere. 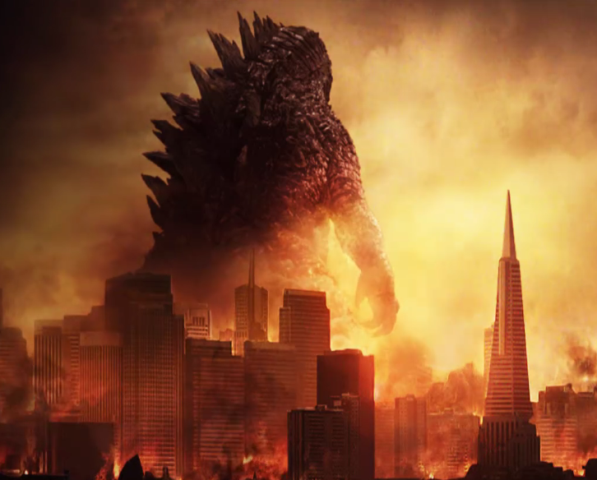 With these various assets "Godzilla" as a film achieves a balance all its own. I thoroughly enjoyed "Godzilla", a film that doesn't hit you over the head with its special effects but soothes you with its confidence and Max Borenstein's straightforward storytelling. It's that rare breed of big-budget Hollywood film we don't get to see much anymore. "Godzilla" is a fine reintroduction to a legendary character, and its original creators will have been proud. This 2014 edition is one of the best depictions of Godzilla, an immense upgrade from Roland Emmerich's 1998 film starring Matthew Broderick. Also with: Ken Watanabe, Elizabeth Olsen, Sally Hawkins, David Strathairn, Juliette Binoche, Richard T. Jones. "Godzilla" is rated PG-13 by the Motion Picture Association Of America for intense sequences of destruction, mayhem and creature violence. The film's running time is two hours and three minutes.